How does one make art. For most of us we might draw or paint but we would not generally consider the art of etching or engraving. The idea of scratching lines onto a sheet of metal sounds like to much work and could we be sure that our scratchings would even hold the amount of ink we wanted. Etching is done by covering a metal plate with an acid-resistant layer of wax called a ground and drawing a design through the ground using an etching needle. The plate is then dipped in acid, which bites into the exposed lines, thus etching the design into the plate. An engraving is made by incising a design into a metal plate by applying pressure to the plate with a pointed tool called a graver or burin. Etching creates delicate and subtle designs while strong lines and sharp definition are main characteristics of engravings. Luckily for us there are artists which did take up etching and engraving. A G Petherbridge is one such artist. A painter, etcher and pastel artist who exhibited in the Midlands and at the major London galleries. His personal artworks are small in number as his main line of employment was poster design for the rail companies. An artist doing what he loves to do and being paid for it. 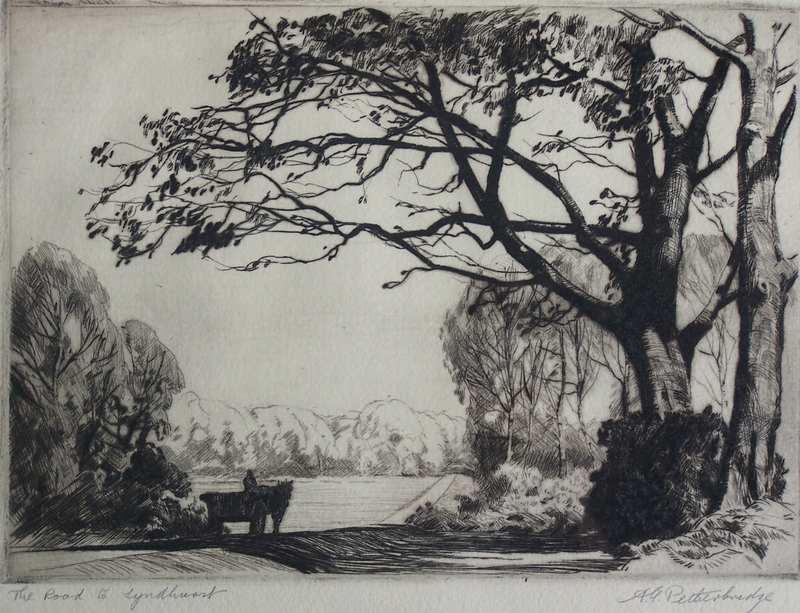 This lovely etching of an horse drawn cart heading down the road shows life as it was. There is no traffic, no one else even on the road. It was possibly even a lonely trip. No hurry, no rush, time to think and ponder, maybe even whistle a tune while travelling down the road betwixt open field and shady copse. Going to Lyndhurst from Bournemouth via the New Forest possibly. The New Forest is a beautiful area, but it is not “natural” in the sense of being untouched by man. The Forest has been moulded by the fads of monarchs and government priorities over the last 900 years: deer; timber for naval shipbuilding; commercial timber production; recreation. The next etching comes from ‘The Oxford Almanac for the Year of our Lord God MDCCCXXX’. That’s 1830 for those who don’t like Roman numerals. 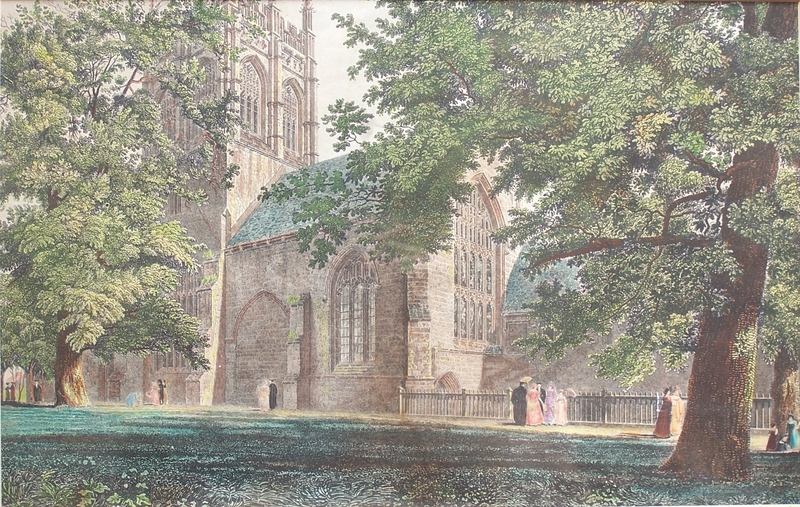 The image is taken from a work by F. Mackenzie and engraved by Joseph Skelton. This beautiful engraving has been hand coloured at some point in time. 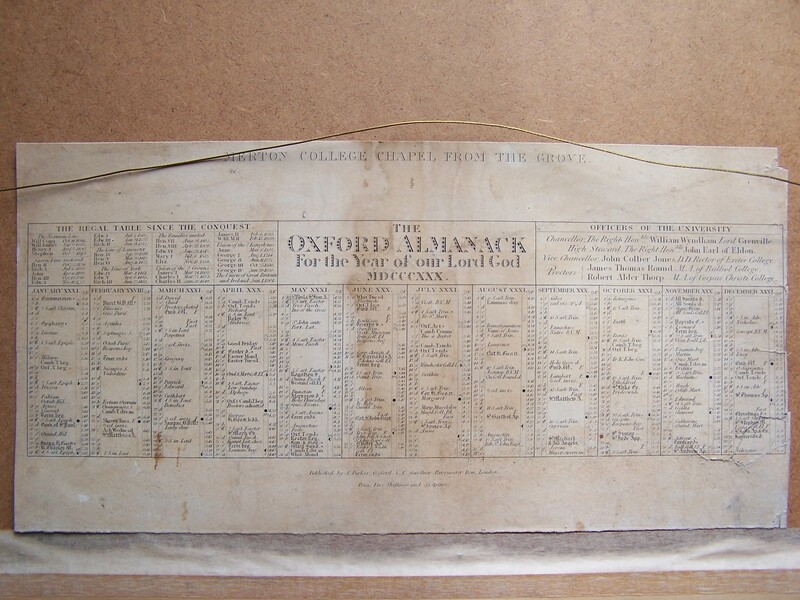 I know that this image is from 1830 since on the back of the frame is adhered the lower section of the sheet which made up the whole almanac page. If one looks closely the engraving is superb. Painstakingly worked and architecturally very accurate. I understand why artists sat and engraved upon sheets of copper for that was the only way of getting artworks to the public and after looking at the images above, I am in awe of them and their talent and very grateful that they did. This entry was posted in Etching and tagged copse, field, forest, horse and cart, Merton College Chapel, New Forest, Oxford, road, students. Bookmark the permalink.